Extremely well balanced set for the professional cellist offering a charismatic sound with an endless palette of colours to work with. The Magnacore A and D are made on a solid steel core and wound with high quality precision rolled flat wire. The medium tension strings are designed for a perfect fit with our Magnacore G and C medium strings whilst the strong combination has been developed to complement our Magnacore G and C strong. The Magnacore Arioso C and G deliver a lower tension without compromising sound volume. Liberating your overall sound and providing easy response and effortless playing in the lower register. The Magnacore Arioso G and C strings are made on a concentric multi-stranded steel core and wound with high-grade tungsten and precision rolled flat wire. 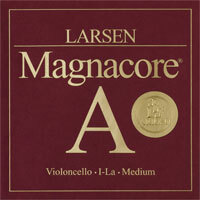 The Magnacore Arioso A and D have been purpose designed for the professional cellist. True freedom of expression with an almost singing quality combined with a focussed colour of tone. 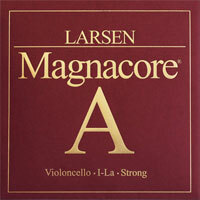 Free your voice with the complete Magnacore Arioso set for cello. 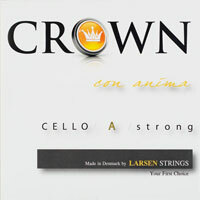 The strings are based on solid steel cores, different in properties and dimensions from their regular counterparts. The A and D strings are wound with precision rolled stainless steel flat wire, the G string with tungsten. A smoothly brilliant sound without metallic overtones. 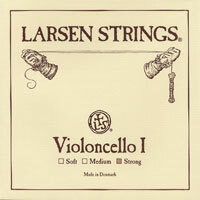 Larsen steel core with the A & D wound with corrosion resistant alloy, the G in nickel and our Crown Cello C in tungsten. Great value without compromise. 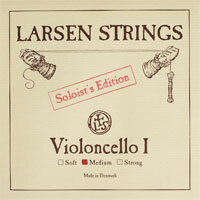 The entire range offers an impressive string response and playing characteristic. In developing these strings, we have remained true to our values of high quality and consistency and manufactured a product of extraordinary value at a highly affordable price.